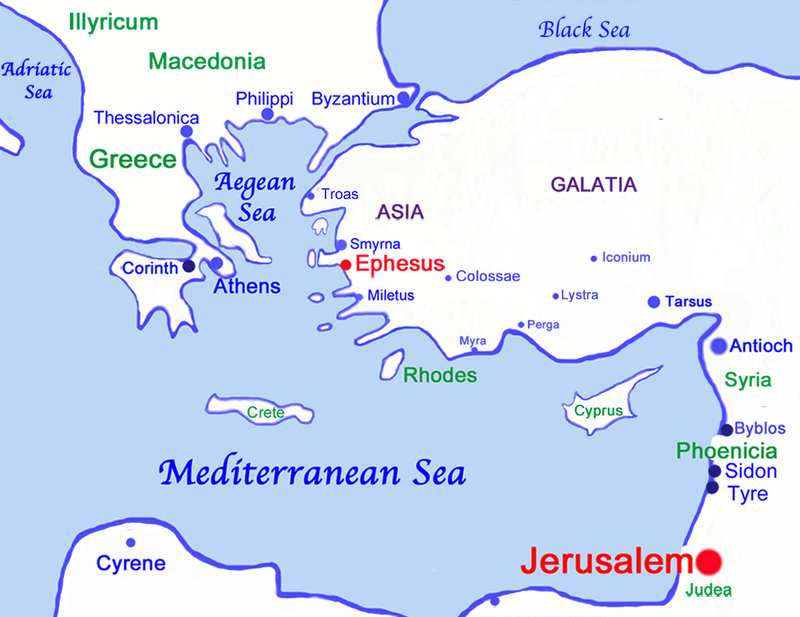 St. Paul visited Ephesus with Priscilla and Aquila on his second missionary journey, and returned to live in Ephesus on the Aegean Sea during his third missionary journey, for a total of three years (Acts 20:31). The Letter of St. Paul to the Ephesians follows his Letter to the Galatians and precedes his Letter to the Philippians in the New Testament of the Bible. The Epistle of St. Paul to the Ephesians is one of the 4 Captivity Epistles, along with Philippians, Colossians, and Philemon. Ephesians 6:20 refers to his being an ambassador in bonds. The letter was possibly written from his imprisonment in Rome in 62-63 AD. The Letter to the Ephesians is most noted for its description of Christ and the Church. Paul speaks of the Father's Plan for Salvation (Ephesians 1:3-6), that he predestined us for adoption to sonship through Jesus Christ. He calls for the Unity of the Church in Christ (1:15 - 2:22); the Church as the Body of Christ (1:22-23); and Unity of the Body of Christ in "one body, one spirit, one hope, One Lord, one Faith, one Baptism, one God and Father of all" (4:4-6). St. Paul outlines the Five-fold Ministry - apostles, prophets, evangelists, pastors, and teachers - and its purpose in 4:11-13. He calls for the exemplary living of its members through one's daily conduct (4:1-5:5); to live as children of the light (5:8 - 5:20); and, finally in the letter's most famous passage, Paul compares the relationship of Christ and the Church to the marriage relationship of husband and wife (Ephesians 5:21-33). God has given us the Holy Spirit as a pledge or earnest - ἀρραβών - (2 Corinthians 1:22, 5:5; Ephesians 1:14), which is the deposit or first installment of a future inheritance, so that we fully possess the promise of God for forgiveness of sins, redemption, and salvation. See St. Paul on Conversion. 4 But God, who is rich in mercy, for his great love wherewith he loved us, 5 even when we were dead in sins, hath quickened us together with Christ, (by grace ye are saved;) 6 and hath raised us up together, and made us sit together in heavenly places in Christ Jesus: 7 that in the ages to come he might shew the exceeding riches of his grace in his kindness toward us through Christ Jesus. 16 and that he might reconcile both unto God in one body by the cross, having slain the enmity thereby: 17 and came and preached peace to you which were afar off, and to them that were nigh. 18 for through him we both have access by one Spirit unto the Father. 7 whereof I was made a minister, according to the gift of the grace of God given unto me by the effectual working of his power. 8 Unto me, who am less than the least of all saints, is this grace given, that I should preach among the Gentiles the unsearchable riches of Christ; 9 and to make all men see what is the fellowship of the mystery, which from the beginning of the world hath been hid in God, who created all things by Jesus Christ: 10 to the intent that now unto the principalities and powers in heavenly places might be known by the church the manifold wisdom of God, 11 according to the eternal purpose which he purposed in Christ Jesus our Lord: 12 in whom we have boldness and access with confidence by the faith of him. 13 Wherefore I desire that ye faint not at my tribulations for you, which is your glory. 1 I therefore, the prisoner of the Lord, beseech you that ye walk worthy of the vocation wherewith ye are called, 2 with all lowliness and meekness, with longsuffering, forbearing one another in love; 3 endeavouring to keep the unity of the Spirit in the bond of peace. 5 one Lord, one faith, one baptism, 6 one God and Father of all, who is above all, and through all, and in you all. 14 that we henceforth be no more children, tossed to and fro, and carried about with every wind of doctrine, by the sleight of men, and cunning craftiness, whereby they lie in wait to deceive; 15 but speaking the truth in love, may grow up into him in all things, which is the head, even Christ: 16 from whom the whole body fitly joined together and compacted by that which every joint supplieth, according to the effectual working in the measure of every part, maketh increase of the body unto the edifying of itself in love. 20 But ye have not so learned Christ; 21 if so be that ye have heard him, and have been taught by him, as the truth is in Jesus: 22 that ye put off concerning the former conversation the old man, which is corrupt according to the deceitful lusts; 23 and be renewed in the spirit of your mind; 24 and that ye put on the new man, which after God is created in righteousness and true holiness. 25 Wherefore putting away lying, speak every man truth with his neighbour: for we are members one of another. 26 Be ye angry, and sin not: let not the sun go down upon your wrath: 27 neither give place to the devil. 28 Let him that stole steal no more: but rather let him labour, working with his hands the thing which is good, that he may have to give to him that needeth. 29 Let no corrupt communication proceed out of your mouth, but that which is good to the use of edifying, that it may minister grace unto the hearers. 30 And grieve not the holy Spirit of God, whereby ye are sealed unto the day of redemption. 31 Let all bitterness, and wrath, and anger, and clamour, and evil speaking, be put away from you, with all malice: 32 and be ye kind one to another, tenderhearted, forgiving one another, even as God for Christ’s sake hath forgiven you. 1 Be ye therefore followers of God, as dear children; 2 and walk in love, as Christ also hath loved us, and hath given himself for us an offering and a sacrifice to God for a sweetsmelling savour. 3 But fornication, and all uncleanness, or covetousness, let it not be once named among you, as becometh saints; 4 neither filthiness, nor foolish talking, nor jesting, which are not convenient: but rather giving of thanks. 5 For this ye know, that no whoremonger, nor unclean person, nor covetous man, who is an idolater, hath any inheritance in the kingdom of Christ and of God. 6 Let no man deceive you with vain words: for because of these things cometh the wrath of God upon the children of disobedience. 7 Be not ye therefore partakers with them. 9 (for the fruit of the Spirit is in all goodness and righteousness and truth;) 10 proving what is acceptable unto the Lord. 11 And have no fellowship with the unfruitful works of darkness, but rather reprove them. 12 For it is a shame even to speak of those things which are done of them in secret. 13 But all things that are reproved are made manifest by the light: for whatsoever doth make manifest is light. 14 Wherefore he saith, Awake thou that sleepest, and arise from the dead, and Christ shall give thee light. 15 See then that ye walk circumspectly, not as fools, but as wise, 16 redeeming the time, because the days are evil. 17 Wherefore be ye not unwise, but understanding what the will of the Lord is. 18 And be not drunk with wine, wherein is excess; but be filled with the Spirit; 19 speaking to yourselves in psalms and hymns and spiritual songs, singing and making melody in your heart to the Lord; 20 giving thanks always for all things unto God and the Father in the name of our Lord Jesus Christ; 21 submitting yourselves one to another in the fear of God. 1 Children, obey your parents in the Lord: for this is right. 2 Honour thy father and mother; (which is the first commandment with promise;) 3 that it may be well with thee, and thou mayest live long on the earth. 4 And, ye fathers, provoke not your children to wrath: but bring them up in the nurture and admonition of the Lord. 5 Servants, be obedient to them that are your masters according to the flesh, with fear and trembling, in singleness of your heart, as unto Christ; 6 not with eyeservice, as menpleasers; but as the servants of Christ, doing the will of God from the heart; 7 with good will doing service, as to the Lord, and not to men: 8 knowing that whatsoever good thing any man doeth, the same shall he receive of the Lord, whether he be bond or free. 9 And, ye masters, do the same things unto them, forbearing threatening: knowing that your Master also is in heaven; neither is there respect of persons with him. 10 Finally, my brethren, be strong in the Lord, and in the power of his might. 11 Put on the whole armour of God, that ye may be able to stand against the wiles of the devil. 12 For we wrestle not against flesh and blood, but against principalities, against powers, against the rulers of the darkness of this world, against spiritual wickedness in high places. 13 Wherefore take unto you the whole armour of God, that ye may be able to withstand in the evil day, and having done all, to stand. 14 Stand therefore, having your loins girt about with truth, and having on the breastplate of righteousness; 15 and your feet shod with the preparation of the gospel of peace; 16 above all, taking the shield of faith, wherewith ye shall be able to quench all the fiery darts of the wicked. 21 But that ye also may know my affairs, and how I do, Tychicus, a beloved brother and faithful minister in the Lord, shall make known to you all things: 22 whom I have sent unto you for the same purpose, that ye might know our affairs, and that he might comfort your hearts. 23 Peace be to the brethren, and love with faith, from God the Father and the Lord Jesus Christ. 24 Grace be with all them that love our Lord Jesus Christ in sincerity. Amen.